Oh man have I sold out? Here I am writing about the food court at Ikea.... Then I thought: You know what...everyone who lives in an apartment around the NJ/NY area has been to an Ikea at SOME point. On top of that as cheap and as good as some of Ikea's stuff is, going there can be a chore and can be a lengthy and near all day event. People will need to take a break at some point, get some grub, recharge, and then head back out to shop. Ikea's philosophy to food is the same as their furnishings....it's not the best quality, but it's cheap! 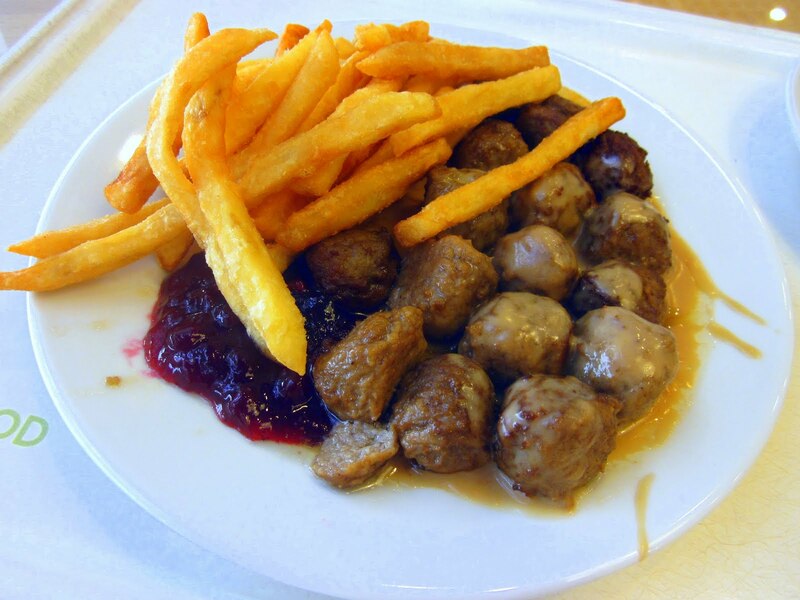 One of their most popular dishes, the Swedish Meatballs, which come at 15 pieces with gravy and a side of lingonberry (kind of like the Swedish equivalent to cranberry sauce), and mashed potatoes (or fries in my case). This dish used to be $4.99 for as long as I remember. So imagine my surprise when I was there about a month or so ago and I saw that they've lowered the price to $3.99! The meatballs are actually decent as are the fries. The lingonberry actually goes well with the meatballs and gravy as well. Other notable deals at the Ikea cafeteria include the .99 cent breakfast, which comes with a small serving of scambled eggs, one sausage link (what'ya expect...two? haha), as well as a strip of bacon. You can't complain that it's a dollar though. Near the food station at the cashier the hot dogs are .50 cents. Pretty good considering a NYC street cart dirty water dog can be $2.